We all know the story. Jesus and the disciples are gathered together to celebrate the Passover meal. Jesus predicts that that very night all of the disciples will fall away on account of him. We can only imagine the extreme remorse and shame Peter must have felt. In spite of all his prideful bluster about how he would never fall away and go to jail or even to death with Jesus, he was intimidated by a servant girl and two others and denied three times that he ever knew Jesus. Lest we become even slightly judgmental of Peter, we must stop and call to mind all of the times that our conduct has denied Jesus or his presence in us. The examples are numerous and varied -– anger, unforgiveness, and resentment; self-indulgence, drunkenness and sexual immorality; failures of integrity in deceit and gossip; failures of kindness, mercy and love; and sloth, laziness and apathy; to name only a few. I can certainly recall examples in my life that encompass several of these categories. While I have repented of these occasions and accept God’s forgiveness and mercy, I still regret them and have remorse for some of them. The good news is that God says, “I will forgive their wickedness and will remember their sins no more.” (Jeremiah 31:34) God not only forgives, but he forgets. His data base on our sins is wiped clean every time we repent. What a glorious promise this is for us! As we proceed through this Holy Week and commemorate the passion of our Lord Jesus Christ with his terrible suffering and death, let us praise and thank God for his plan for reconciliation and salvation. By God’s immeasurable love for us, he became one of us in all aspects of our human existence, was willing to suffer and die for us, and gives us the promise of life forever with him through the power of his resurrection. This entry was posted in Uncategorized on April 16, 2019 by Bill Dalgetty. Jesus makes this promise to the disciples in his last conversation with them before his arrest later that evening. This is not like the promise of heaven that we cannot experience until we die. This is a promise for today, for right now! Think of it! Jesus and the Father are in us, present to us, available to us at every moment. Wherever we are, whatever we are doing, they are available to guide our conduct and help us make the daily choices in our lives. St. Paul eloquently captures the essence of this when he declares, “The mystery that has been kept hidden for ages and generations is now disclosed to the saints…which is Christ in you, the hope of glory.” (Col. 1:26-27) Our hope is in Christ and Christ in us! Why is it that so many of us do not always experience the reality of Christ residing in us? The answer may be found in the individual choices we make that determine whether God is buried alive or made alive in each of us. Do we bury God’s presence in us, hiding him – or do we let him be seen, heard and experienced? In my early adult years I lived my life in a way that mostly buried God’s presence in me rather than allowing that presence to be manifested. I believed in God and attended church regularly. 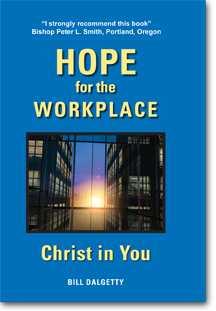 Yet my Christian faith had become secondary to other so-called priorities, namely my career. I seldom thought about God’s presence in me, and so that presence wasn’t visible to others either. Fortunately, through God’s grace that changed one October evening when I was faced with the opportunity to turn over my mixed priorities to Jesus. It was a watershed moment. I am still capable of forgetting that Jesus is present to me in how I respond to an unsolicited phone call, or a possible offense from a family member or friend, or when I wrestle with a request to help or serve another. The good news is that we can repent of these times and bring our selves back into God’s presence. We can then call on his gifts of wisdom, discernment, and courage to make daily choices consistent with Jesus’ teaching and partner with him in building his kingdom on earth in our time. This entry was posted in Uncategorized on April 9, 2019 by Bill Dalgetty. We are familiar with the story. Jesus is trying to tell the disciples what will soon take place; that he would be with them only a little longer and where he was going they could not follow. Peter protests, pledging his loyalty and that he will follow Jesus anywhere, even if it meant giving up his life. Peter was no doubt sincere in his intention. Then the unexpected happened. Interrupting the disciples’ sleep in the Garden of Gethsemane, temple guards came in the dark of night with torches, clubs and swords to arrest Jesus. In the chaos of the moment, the disciples flee and Peter “follows from a distance.” Later in the courtyard of the high priest, he denies that he knows Jesus three separate times. How often have our good intentions been laid aside when faced with challenging circumstances or just the procrastination from our own sloth? We tell God or someone we are going to do something and then we don’t do it. The examples are numerous. Our greatest failure with good intentions likely manifests itself with the sin in our life. Many of our sins are recurring. We confess them or commit not to do them again, and then do so. Good intentions are also negated when we fail to keep our word. We commit to our family that we will be home for the family evening meal, and then we let a work demand get in the way, not just once in a while, but on a regular basis. We say to a friend we have not seen for a while, “Let’s have lunch.” Then, we never follow-up to schedule it. We commit to attend one of our children’s or grandchildren’s sporting events, and then let an intervening circumstance take precedence. We commit to have a prayer time before breakfast, and then fail to get out of bed in time. Good intentions and love are similar. They both require action to become fulfilled. The Good News is that this same Holy Spirit is available to us just as it was to Peter and the disciples. With the gifts of the Holy Spirit and God’s grace, we too, can see our good intentions become a reality. This entry was posted in Uncategorized on April 2, 2019 by Bill Dalgetty. The Gospel of Luke reports that after Jesus submitted to the Father’s will to accept the cup of his passion, God sent him an angel to strengthen him to endure all that he would be facing. Our human suffering, however severe, may never equal Jesus’ “agony in the garden.” Yet, how often have we seen people endure incredible suffering from a terminal illness or the loss of a loved one with determined faith, while still maintaining an unusual peace and joy that can only come from God? Sometimes God uses one of his special angelic messengers to bring strength and consolation. Sometimes he uses family or friends to perform this role. This brings to mind an experience I had when I was 15 years old following surgery to correct a defective sternum bone that I was born with. The lower part of my sternum was bent inward that had the effect of crowding the heart and lungs as I started growing in my teen years. This apparently caused an enlarged heart, severely impacting my future health and long term survival. We were living in Mason City, Iowa, about 120 miles north of Des Moines. A thoracic surgeon in Des Moines had developed a corrective repair that involved splitting the sternum from the rib cage, inserting a bone strut from one side of the rib cage to the other and laying the sternum back down and wiring everything back together. This was considered experimental surgery in the mid-1950s, when they were not quite as good at pain management as they are today. As a result, I was in a lot of pain from the surgery and discomfort with all of the tubes continuously pumping fluids from my chest cavity. I remember telling my parents, to their consternation, that I would not have done this if I knew it was going to be so bad. On the fourth day, Father John from our parish in Mason City visited me. We had become very close friends during the course of his weekly instructions for me to join the Catholic Church a couple of years earlier. To make this visit, he had to drive two hours after Sunday morning masses from Mason City to Des Moines, and then two hours back in time to say a Sunday evening mass. He talked with me, encouraged me and said a prayer with me. He was like the visitation of an angel lifting my spirits. I didn’t complain any more to my parents about the surgery, and spent the rest of the summer recuperating. I have always remembered how his visit turned things around for me, along with the sacrifice it took for him to make it happen. Like Father John, may we be inspired to serve as angels to others in their time of need. This entry was posted in Uncategorized on March 26, 2019 by Bill Dalgetty. What Happened to the Other Thief? These are words of Jesus to the disciples as they gazed on the grandeur of the temple in Jerusalem. Jesus seems to be mixing descriptions about both the destruction of the temple by the Romans in 70 AD and his second coming at some later date. We know neither the day of our death nor the day of Jesus’ second coming, only that both will certainly occur. Jesus is urging us not to let the cares of the world overtake our lives and push aside God’s desire and purpose for each of us. Since the non-physical aspect of our existence (our souls) lasts beyond our physical lives, Jesus is saying he wants us to end up with the Father and not separated from him forever in hell. We may not hear a lot about hell these days. It is interesting that during the apparitions of Mary at Fatima, Portugal, in 1917, she showed the three children to whom she appeared a short vision of hell to emphasize its horrors and the absolute necessity to pray for the salvation of souls and the direction of the world at large. She warned that if people did not change their ways, a worse war than the present would come and that Russia would continue to spread its errors and persecution of the church. With the busyness of everyday life and the distractions of getting ahead in this world, we may tend to neglect our own souls and the souls of loved ones and others. During this lent as we prepare to give special attention to the death and resurrection of our Lord, may we renew our prayer and actions to grow closer to God and pray for the souls of others. This entry was posted in Uncategorized on March 12, 2019 by Bill Dalgetty. Peter and John had healed a cripple by the temple gates by invoking the name of Jesus. The Sanhedrin called them to account for their actions, ordering them not to speak in the name of Jesus in the future. They refused, and the Sanhedrin was furious, wanting to put them to death. A Pharisee, named Gamiliel cautioned them that if what the apostles were doing was of human origin, it would eventually fail, but if it was from God, the Sanhedrin may find themselves fighting against God. Imagine! For healing a lifelong cripple, the Sanhedrin had the apostles beaten with whips. In Roman times this was done by stripping the person of his clothes, tying his hands to a post and beating him with a whip that had leather straps and sometimes pieces of nails or other objects at the end of the straps to more deeply tear into someone’s flesh. And what was the apostle’s reaction to being flogged? Luke tells us that they rejoiced for having been worthy to suffer for the name of Jesus. Several years ago at a colleague’s retirement party, I honored him for the way he treated people with care and respect. In doing so, I told Jesus’ parable of the Good Samaritan who came to the aid of someone who had been attacked by robbers and left to die by the side of the road. Apparently I unknowingly offended someone when I made reference in the story to a Levite and a Jewish priest who had passed by the person having been robbed. The next evening I received a threatening phone call. I was accused of maligning Jewish people and their religion, and that the caller said he would get even with me. Of course, my small example does not begin to compare to the way Paul and other early Christians were persecuted, or for that matter, the millions of Christians that are being persecuted in the world today. Christianity Today International reports that 215 million Christians experience at least a high level of persecution. One example cited twenty-three Christian leaders that were killed in Mexico in 2017. While Christians in our country have not experienced persecution as in some countries, we are not immune from this concern in view of societal trends dealing with life, marriage, and sexual conduct. This entry was posted in Uncategorized on March 5, 2019 by Bill Dalgetty. These were words from Peter to the people who were present when God poured out his Holy Spirit on the apostles and the early Jewish followers of Jesus at the Feast of Pentecost. This has long been regarded as the start of Christ’s church. The Book of Acts tells us that those looking on heard a sound like the blowing of a violent wind and saw about 120 of Jesus’ disciples praying in languages not their own, praising and worshiping God. They asked Peter what this all meant. Though Peter’s words were directed at the people in front of him, they are in fact timeless, applicable to generations beyond his own, including our present generation. The loss of respect for life in our current day, the confusion over truth, the erosion of integrity, the diminishing state of sexual morality and the abandonment of principles of natural law, all point to corruption in our present generation. That’s us! We are far in distance and time, but Peter’s words are meant for us just as they were to the people of his day. Repent of our sins, believe in the Lord Jesus Christ, and we can receive the gift of the Holy Spirit to enrich and empower our lives. Then, we can be a leaven to our present generation by bringing the presence of Christ to the people and circumstances of our lives through our words and actions. This entry was posted in Uncategorized on February 26, 2019 by Bill Dalgetty.